The cover is an answer to that old joke. Guess what? I hope you’ve heard of Locally Laid, the farm. They’re located in North Minnesota, which is not an ideal place to start a farm. When Lucie’s husband Jason lost his job, he thought it was a good idea to start a chicken farm. They’d had good luck with back yard chickens, and there weren’t many locally sourced, ethically farmed eggs in near Duluth. How hard could it be? My favorite chick was the tawny-colored Buff Orpington. She promised to one day be a bodacious plus-sized model of a chicken, wearing fluffy pantaloons under full feathery skirts and with as charming a personality as her appearance suggested. Predictably named Buffy, she didn’t mind being handled and rather seemed to enjoy the company, clucking softly with a closed beak as I picked her up and stroked her silky feathers. While the farm’s name has a cheeky double entendre, it is meant first to be taken literally–these eggs are from local chickens raised on pasture and allowed to roam outdoors. Reading the details of how this farm came to be, with the numerous obstacles, setbacks, and reality checks along the way, is an emotional roller coaster. I wanted the farm to succeed. I wanted Jason to sleep. I wanted Locally Laid to win the Super Bowl contest. I wanted to hear more from Lucie’s son Milo, because he stole the scenes he was in. Some of these things happened, some didn’t, and some sorta kinda did. 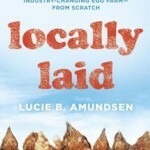 Locally Laid is a lovely mix of memoir and education on the state of agriculture in general, and chicken farming in particular. I was reminded more than once that I’m one of many people who has thoughts, opinions, and feelings about chickens, yet has never actually wrangled one. If you’ve read and enjoyed Michael Pollan’s Omnivore’s Dilemma, or Mark Bittman’s Food Matters, then belongs next to them on the shelf. Support a writer and farmer; buy this book, read this book. It will make you smile and you’ll learn stuff. This entry was posted on Tuesday, March 15th, 2016 at 9:46 am	and is filed under 2016 Books, Feeling Minnesota. You can follow any responses to this entry through the RSS 2.0 feed. Both comments and pings are currently closed.